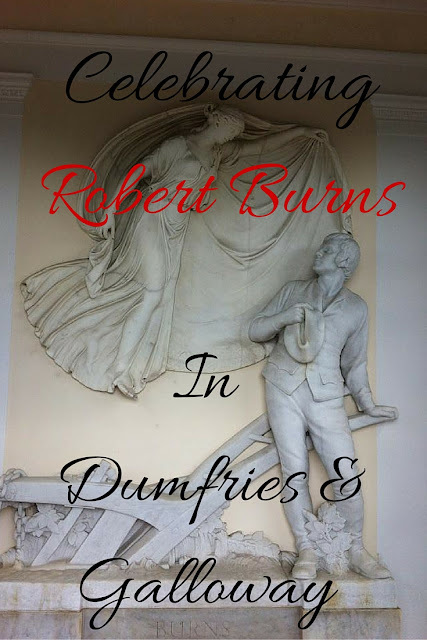 I was lucky enough to work in Dumfries and Galloway during my time with VisitScotland and many of the attractions that I graded in the area were related to the life and work of Scottish poet, Robert Burns. The Scots are very proud of their Bard, much in the same way that the English are with Shakespeare and the Irish are of James Joyce. We’ve carefully conserved his various residences, books, belongings and moved his body from the pretty poor grave he originally had, to a far more appropriate, and might I say, pretty grand, resting place he now lies. 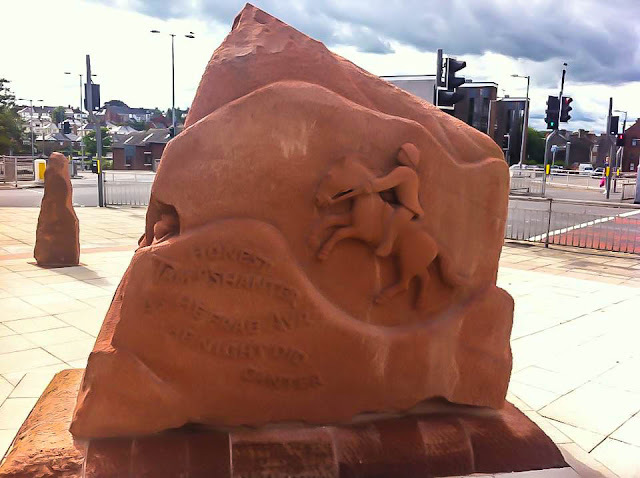 Dumfries is full of tributes to their most famous resident. As far as Dumfries goes, it is synonymous with Burns’ life and work, in the same way that Ayrshire is. Burns lived in the town centre, as well as owning a cottage in the countryside, and his remains lie in the local graveyard. Even the pubs he frequented wisely choose to remember him. His long suffering wife has also managed to find herself the subject of a beautiful statue in the town which, after putting up with his inability to be faithful, in my opinion, she thoroughly deserves. Burns worked as a modern day equivalent of our deeply beloved HMRC’s tax/VAT inspector and he would ride around on his trusty steed, making sure the locals were paying the correct amount of tax. He must’ve been wildly popular during business hours. Conveniently located on Burns St (because obviously), in the middle of the town, this is the 18th Century building where the Scottish national poet spent the last years of his life. The chair Burns used to write in, plus the famous Kilmarnock edition of his work, is prominently displayed in the building. One of the best features of the small house is Burns’ carving of his name in the upstairs window. If you venture just outside the house, there’s also a beautiful garden area, full of flowers and stone carved excerpts from his most famous works. Burns House has no admission charges. 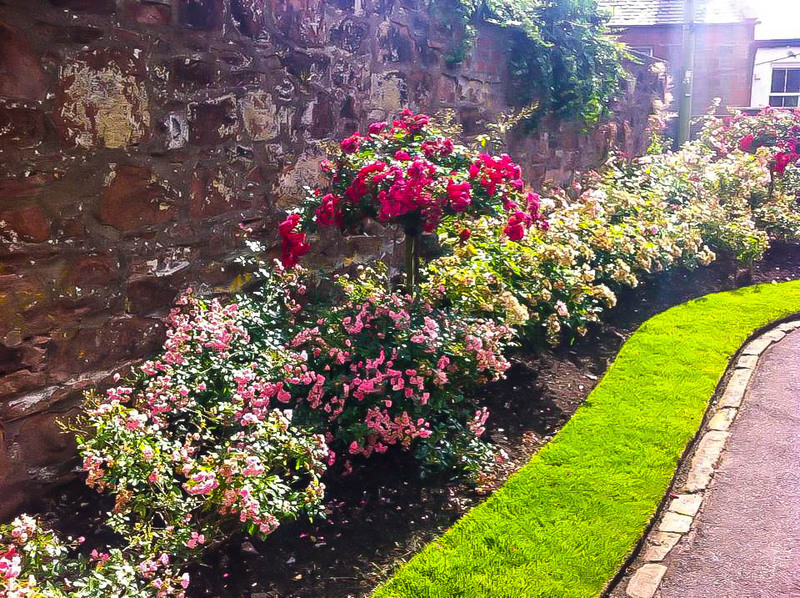 After his death in July of 1796, Robert Burns was laid to rest in St Michael’s Churchyard in Dumfries. His original grave was unimpressive, so his body was moved to a more appropriate area of the yard 20 years after his passing. Burns and his family now have a beautiful Mausoleum in the corner of graveyard, which is much more fitting for a person of his talent and fame. You can visit the outside of the grave on your own, but you can also link up with a staff member from Burns House, who conduct free tours of the Mausoleum and hold the key to allow you inside. Ellisland Farm is situated around 7 miles North of Dumfries and is in a beautiful setting on the banks of the River Nith. The peaceful surroundings give you a sense of what it might have been like to find inspiration in the whitewashed cottage and well-tended grounds. Many of Burns’ possessions remain in the cottage and there are several walks and trails along the riverbank. Burns moved to Ellisland with his family when he was 29 years old and the cottage was where he wrote ‘Red, Red Rose’ and ‘Auld Lang Syne’. Standing proudly on the High Street since 1610, The Globe was the preferred watering hole of the famous Bard during his time living at Ellisland and, latterly, in the town centre, from where it must have been much easier for him to stagger home. The Globe has kept Burns’ favourite drinking seat (all Scots have one of these) and you can have a wee dram from the comfort of it. I’m actually not sure if it that comfortable as it’s really, really old. However, once you’ve had a few whiskies, your read end will be numb so, who cares? The Globe also has a small museum and gift shop on site, to fulfill all your Burns related needs. 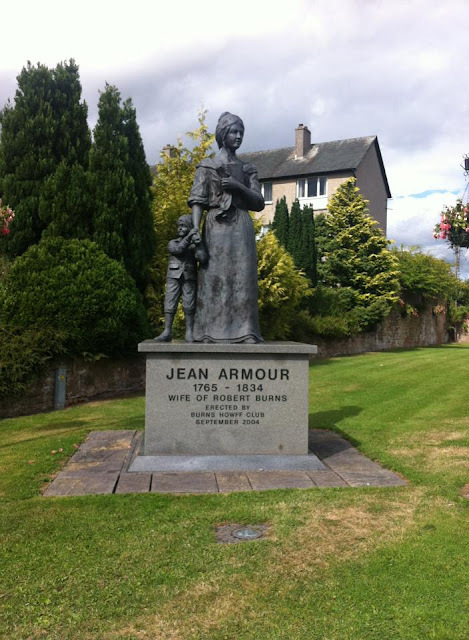 Jean Armour was the long-suffering wife of Robert Burns and, if there were living in this day and age, she’d probably have divorced him a long time ago. However, despite her husband’s continual indiscretions, his love for Armour was clearly strong and the couple remained together. Armour bore nine children with Burns and that, as far as I’m concerned, is deserving of a statue in itself. 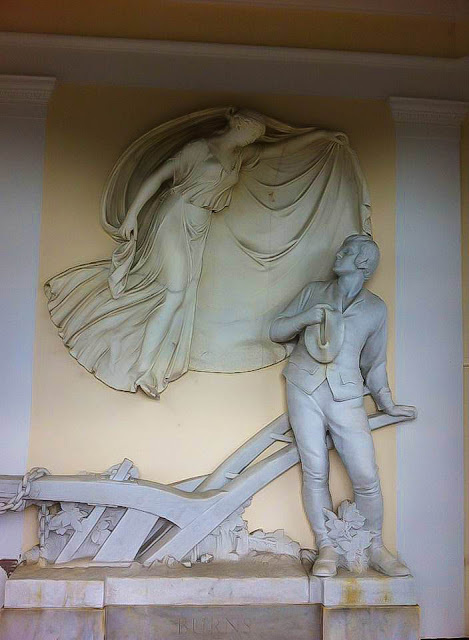 Jean’s influence on Burns’ writing over the years was great, and he wrote many love poems about her, one of which is ‘O Were I On Parnassus Hill’, which was penned on the farm at Ellisland. Burns also wrote many poems for his other women, but he always returned to Armour’s side. Jean outlived her husband long enough to see his work gain global fame. 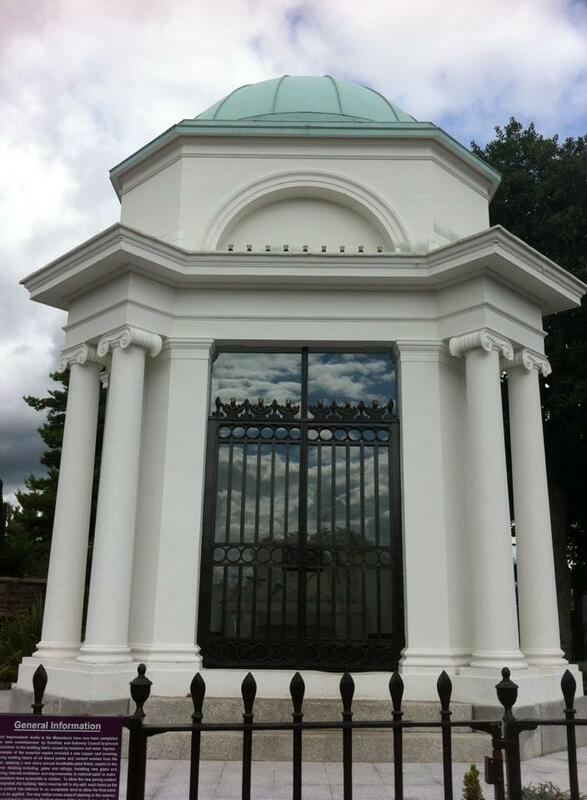 She ws buried in the specially commissioned Mausoleum at St Michael’s after her death in 1834. 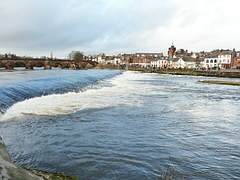 Set next to the old bridge on the banks of the River Nith at Mill Street, RBC takes you through the 8 or so years that the poet spent living in the town. As with many of the other attractions, this small museum is run by team of dedicated volunteers who have a genuine love for the life and work of the Bard. This gorgeous old water mill features an audio guide, as well as original papers and manuscripts belonging to the famous poet. The building also houses a gift shop and café and has no admission charge.